From necessity and for pleasure I eat out a great deal in Chiang Mai but, even so, I find it difficult to keep up with new and changing restaurants in the city. Last week I visited, on consecutive nights, a new venue and a well established favorite. The former is the latest venture by Stefano, well know for La Gondola and other Italian trattoria, and is called Caffè Gourmet. The second, Mo’C Mo’L, was packed with ‘smart’ Thais and a few visitors, who on a Monday night filled to capacity the extra spaces provide by an extension of the terrace area. 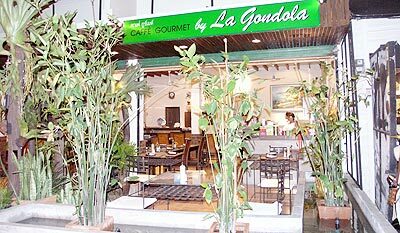 In truth the new place was not yet what the elegant advertisements promised in that it did not provide ‘international cuisine’, but offered a menu from La Gondola which was similar to the nearby Girasole. I’ll await final judgment until they settle in but it was, unsurprisingly, professionally run, offered a pleasant atmosphere with attentive staff and featured a familiar menu. From a range of interesting starters my two companions and I chose a substantial platter of deep fried vegetables, a puff pastry dish with anchovies and cheese, and grilled egg plant on toast. Each was around 120 baht. For my main course I chose the delicious sea food salad in an Italian vinaigrette, (with extra olive oil thoughtfully provided on the side), and my friends went for baked New Zealand mussels and a splendid concoction of scallops and prawns baked in a light mousse - at 300 baht, the most expensive dish on the large menu. We stuck to beer Singha (60 baht) and only I ordered a dessert, a lemon sorbet. This was all very pleasant and well presented but I could not help wondering just how many more new restaurants Chiang Mai will absorb, before casualties occur in the low season. Giorgio’s has seemingly opened an offshoot, in the location of the Shangri-La Hotel, and I will report on that in a couple of months. With Thailand suffering from something of a slump in tourism and a high season that this year seems less than buoyant, I wonder whether the growing number of large hotels, often with good - if expensive - restaurants, and also the independent eating places, can continue to expand. However, “expand” is what Mo’C Mo’L seems to have done with great success. The most attractive side of it is definitely the large decked area surrounded by water and high trees with their hanging lanterns. The fountains add a soothing touch and the large white canopy and ultra modern bar which flanks much of the seating area give a bright and glamorous feel to an already elegant venue. There is probably no prettier environment in the city in which to eat. And, of course, it is ultimately the food which counts. 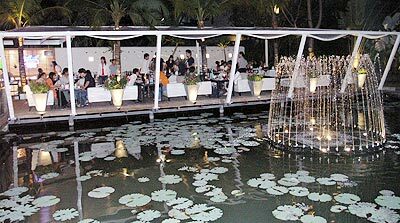 I went with a Thai friend after seeing the new Richard Gere movie and we arrived at around 9 p.m., luckily finding a table near the pond. Despite the number of customers we were quickly served with our three shared dishes: asparagus and broccoli with prawns in oyster sauce, deep fried fillets of fish, and squid in a Penang curry sauce. Each was around 120 baht. If we had not each succumbed to a cocktail (I went for the Jack Apple at 160 baht) and a glass of wine, the cost would have been very reasonable, rather than moderately high. This, though, is not the place for a simple or quick meal. 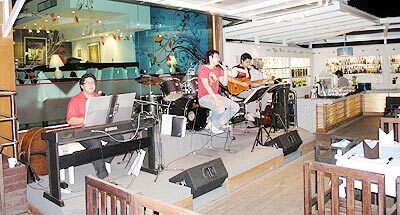 When we arrived, there was an attractive trio playing mainly Thai songs, who gave way at 9.30 to a jazz orientated quintet fronted by an excellent female vocalist. There is also a large bar area which, on Mondays, does not feature the usual music and therefore offers a quieter environment for a pre- or after dinner drink. So dining out becomes a relaxed and entertaining occasion with a wide choice of Thai, Japanese and some European food to choose from. What distinguishes this venue from other ‘modern’ Thai or classic Thai restaurants is the superior management skills which seem to make the whole experience one of effortless ease. No wrong or delayed dishes, no long wait for the bill when you finally ask for it and no mistakes on it when it comes. They have a large parking area and an attractive coffee shop which offers internet connection and was busy even in the late evening. I think that in 2008/2551 many restaurants will be searching eagerly - even desperately - for customers, but not this venue, which can be found at the top end of Huay Kaew Road, on the left after Canal Road just before the CMU buildings. Caffè Gourmet is at 39/7-8 Ratchamanka Road. Tel 053-283824. Minestrone soup would be as Italian as Michelangelo’s David, but unlike the famous statue, you can substitute many vegetables and not take away from its Italian heritage. It was, after all, a soup made by Mumma, with whatever was available at the time. Add one tablespoon of olive oil to the frying pan and warm to a medium heat. Add the chopped streaky bacon pieces and turn them frequently for two minutes. Add the chopped onion and cook for a further two minutes. Turn the heat down low then add the remaining two tablespoons of olive oil, carrots, celery, tomato and garlic. Season with salt and pepper and cook for 15 minutes stirring every five minutes. Add the risotto rice and stir well for three minutes. Add the stock, tomato puree and basil to the pan. Bring the soup to the boil then simmer for 30 minutes. Add the chopped cabbage. Stir in well and cook for another 30 minutes, seasoning when necessary.